There’s nothing like exploring on foot to get a real feel for a place, so I was very pleased to join a guided walking tour earlier this week. The tour in question was around a part of Oxford that was completely unknown to me — and I have worked in that city for almost twenty years! My only excuse is that the area is not on the usual tourist trails. Believe me, I’ve done them, and then some. 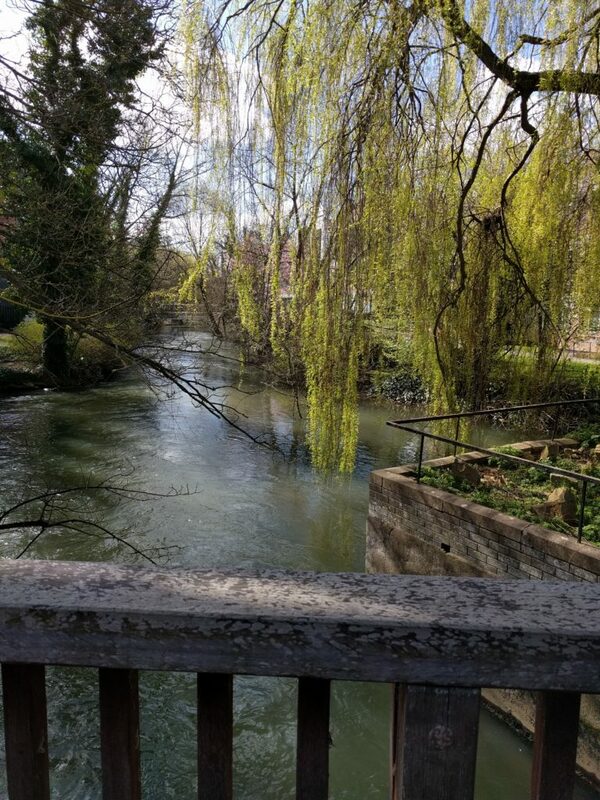 I thought I knew Oxford, but this tour opened my eyes to a history and architecture that was figuratively miles away from the dreaming spires. So, on Monday last, husband and I set off for Oxford. We were lucky with the weather — although not ever so warm, it was a bright sunny day. We met up with our guide, the wonderful Liz Woolley, near Oxford Castle. For those of you who don’t know, Liz’s knowledge of Oxford and its out-of-the-way places (and its more well-known ones) is quite awesome. You can probably tell, I’ve been on one of her tours before. 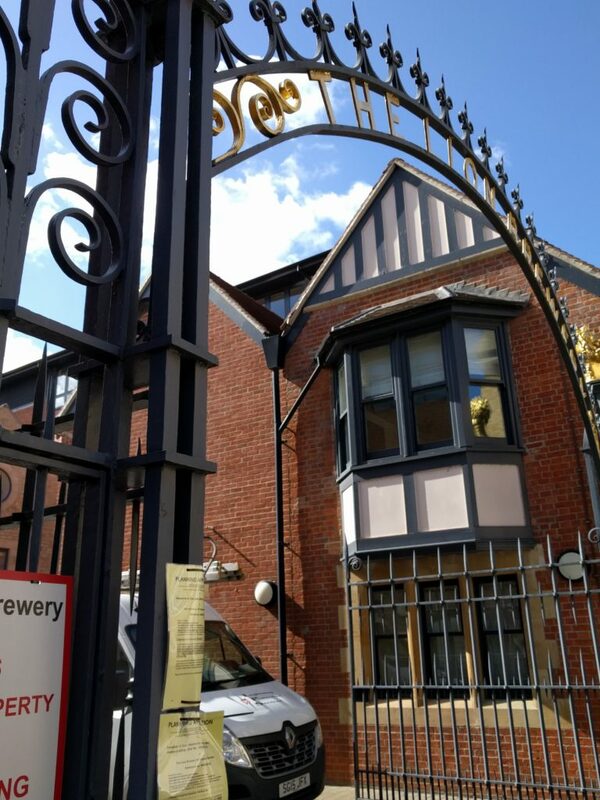 This walk was around the parish of St Thomas’, which in the past, was one of the poorest areas of the city and home to many of the city’s breweries. Liz started the tour by leading us out of the city walls, near Oxford Castle, towards what was originally Fox’s Malthouse. This distinctive 18th century building has now been converted into offices used by the University. From there, we crossed the delightfully-named Quaking Bridge and headed up St Thomas’ High Street. Quaking Bridge, built in 1835 replaced an earlier medieval bridge. Branching off the High Street, on the other side of the bridge, is Fisher Row. Here stands the impressive house built in the 1790’s for Edward Tawney. 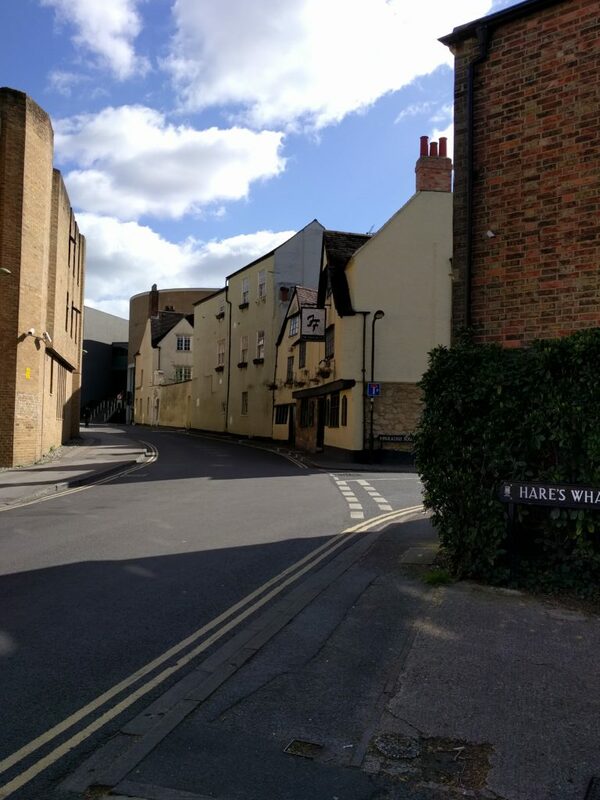 Tawney was several times Mayor of Oxford, a maltster, and also a philanthropist — the almshouse he established for three poor men and three poor women is actually next door to his own house on Fisher Row. 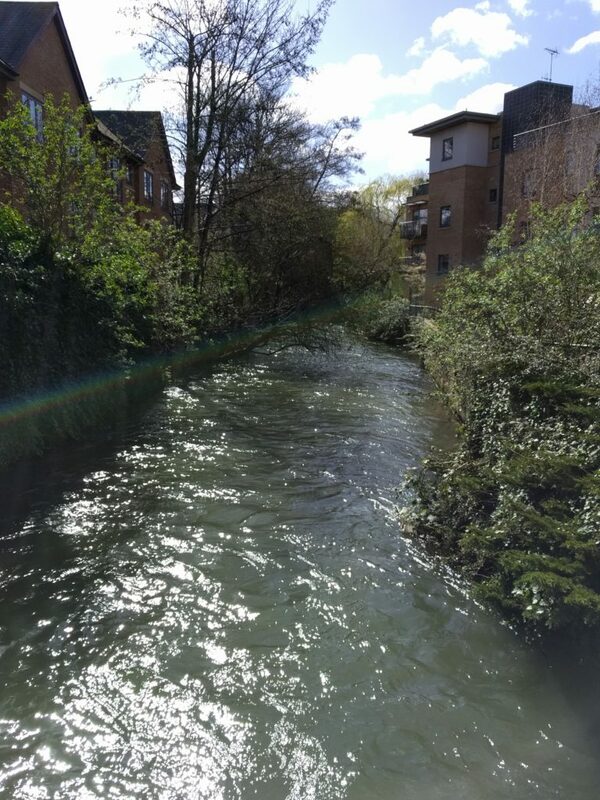 Waterways cut across this small parish, practically round every corner there is a stream or canal, reminding me that Oxford, although famed for its ancient university, was once a very busy inland port, with goods coming in by barge, as well as road and rail. 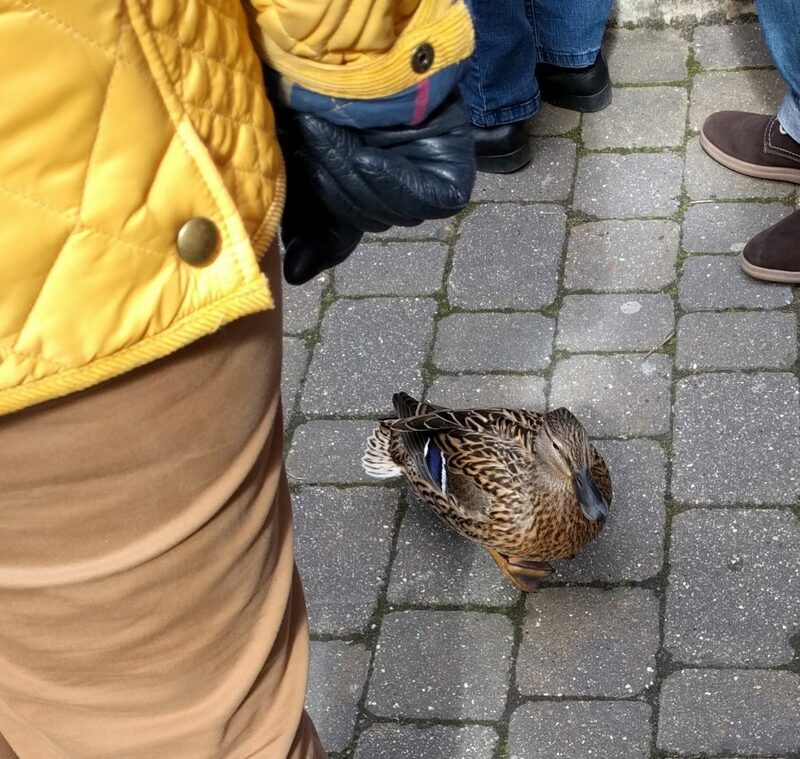 Where there are streams and waterways, one can usually find wildlife. Our walk showed us many old buildings converted to modern usage, usually residential. 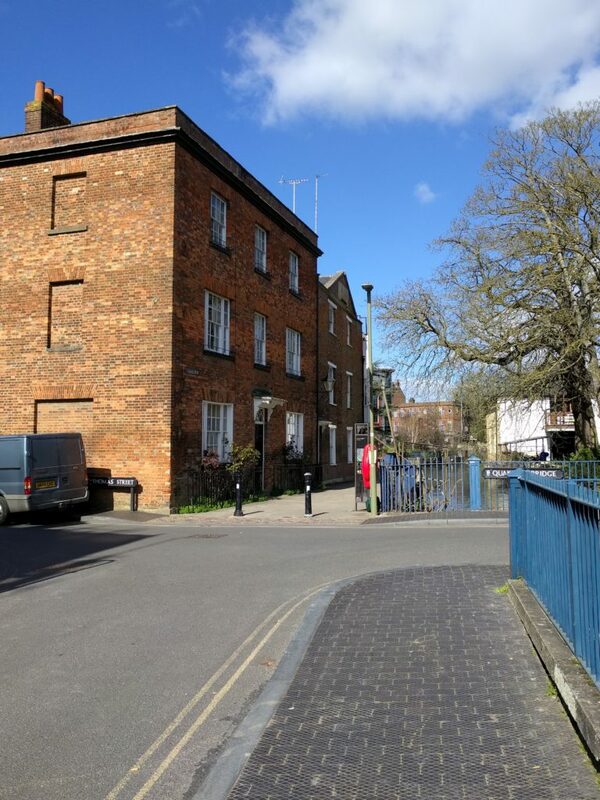 It is ironic that parts of this once poor area of Oxford, now boasts some very pricey housing stock. An example of this is the Lion brewery, established in 1797, it ceased production in 1998, and now modern apartments stand in its place. However, remnants of its past remain, such as the gates that bear its name. 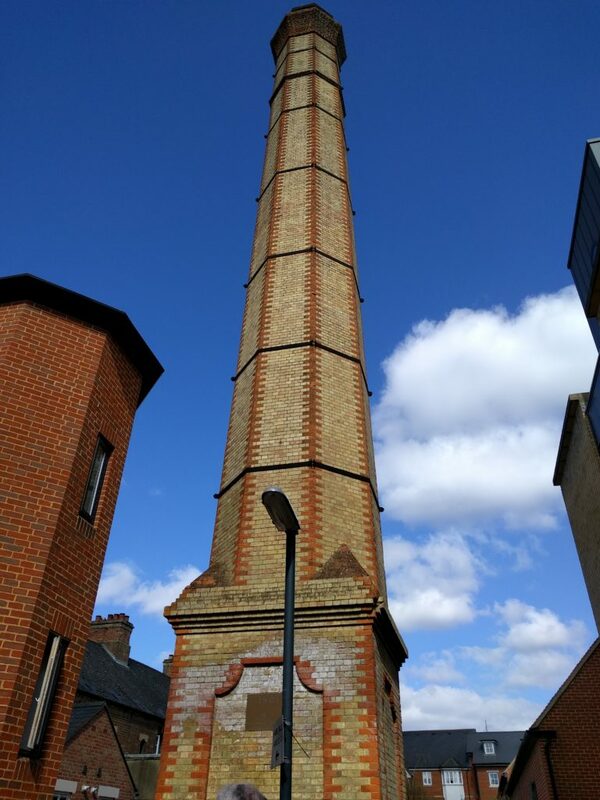 The brewery’s waterwheel has also been retained, though you have to look hard to spot it, as has the tall brewery chimney, restored and a nice reminder of the area’s industrial past. 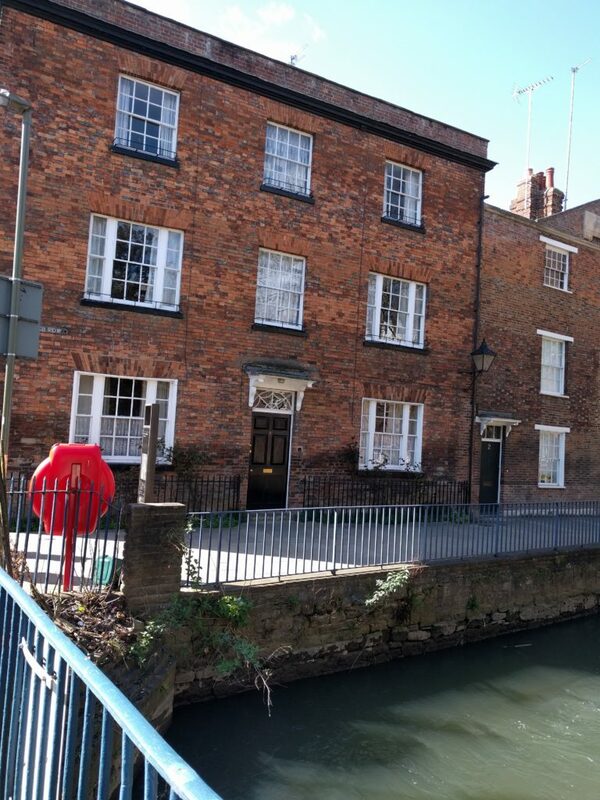 Our walk continued, and we discovered fine examples of model social housing, small cottage terraces, parochial schools for the children of the poor, and even a jam factory. 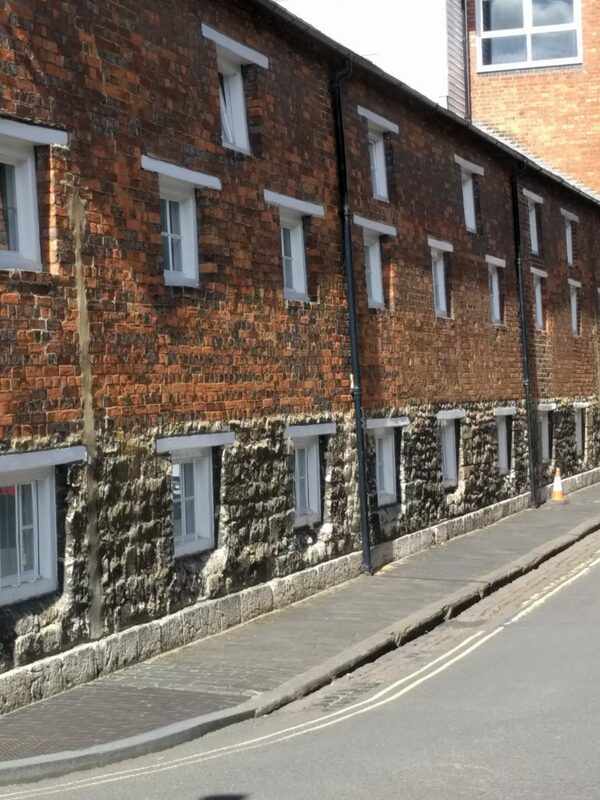 We heard stories of local philanthropists, common lodging houses, a horse hospital, clogs, and temperance hotels — St Thomas’ has certainly enjoyed a colourful and varied history. The end of our walk brought us to the church for which the parish is named. 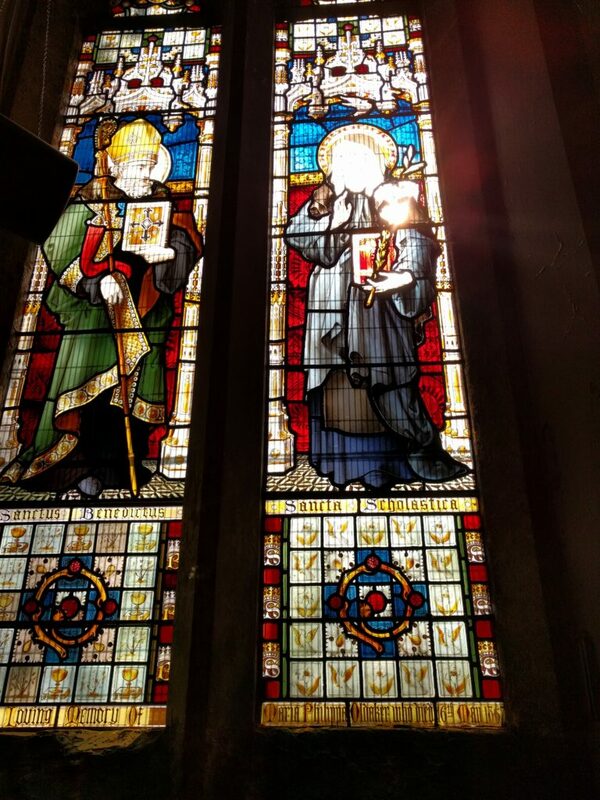 Properly named as St Thomas the Martyr Church, it was founded in the 12th century and dedicated to St Thomas Becket. 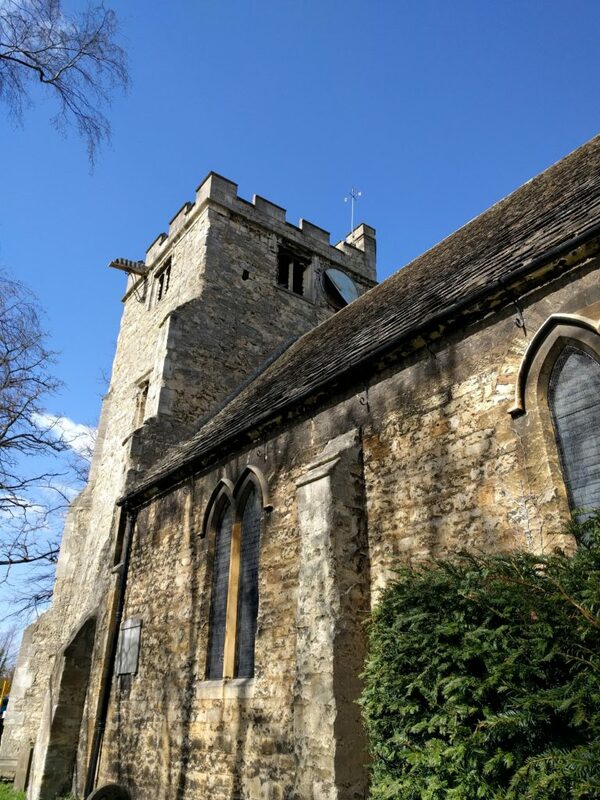 Originally a chapel to the nearby abbey at Osney, after the Dissolution of the Monasteries, it was placed under Christ Church, Oxford and from thence it was treated as a parish church. Alas, parishioner numbers declined over the years, until in 1802 only ten communicants were recorded. By the mid 19th century however, St Thomas’ became associated with Tractarianism (a movement within the Anglican Church, whose members, most associated with the University of Oxford, argued for the reinstatement of some older Christian traditions of faith); many of the leading lights of the Oxford movement preached at St Thomas’. 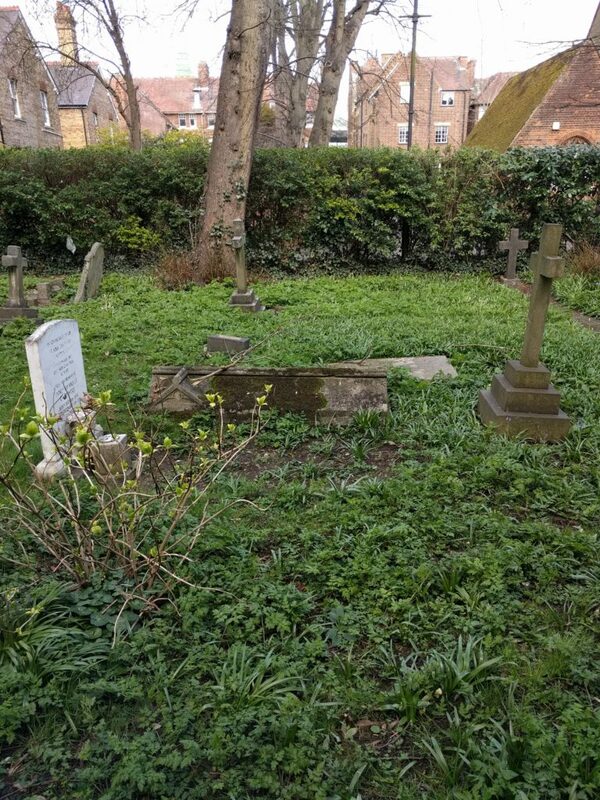 Walking round the outside of the church, and its graveyard with ancient tombstones tilted at funny angles, one would never guess that bustling Oxford city centre was only a short walk away. 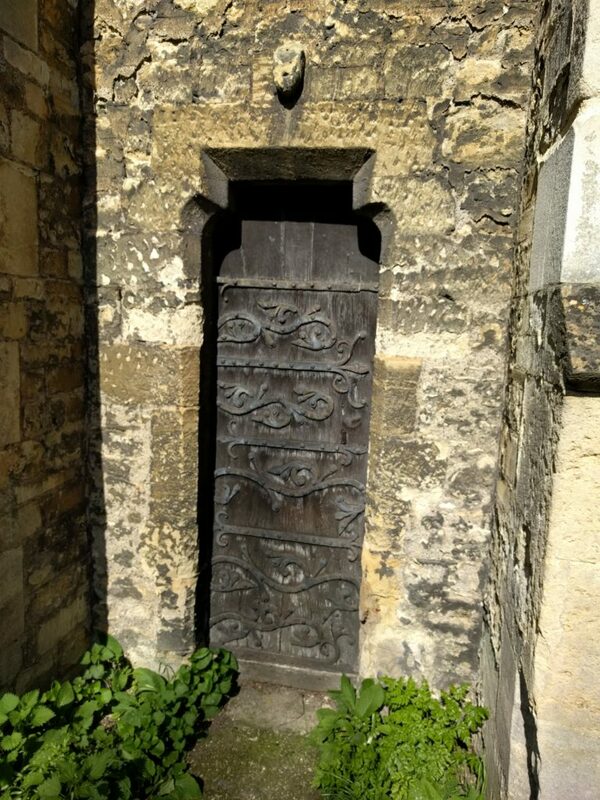 A door in the south wall of the church is said to date from the 13th century and is allegedly the oldest door in Oxford. The church tower looks sadly neglected, the clock face is detached and seems about to fall off. The oldest door in Oxford? We were lucky enough to be able to go inside the church — a special highlight of the tour. Most days of the week it is closed to visitors. 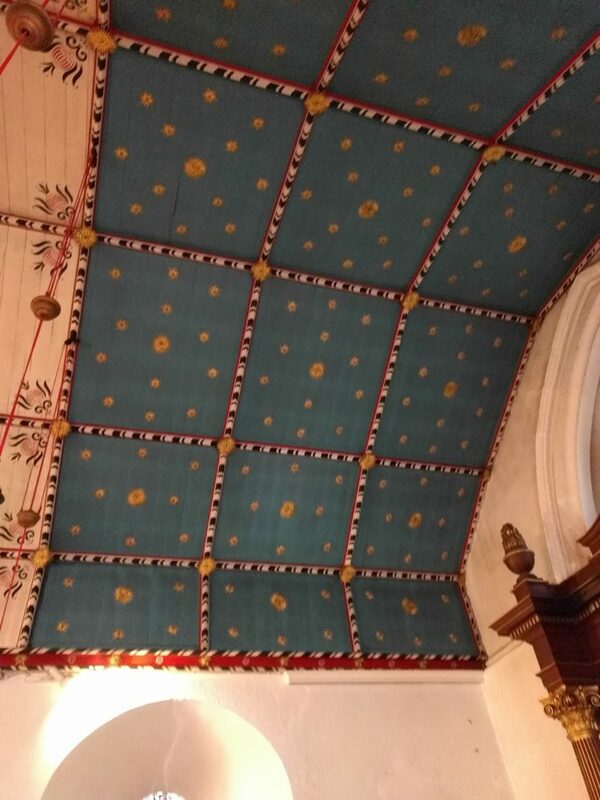 You can see my photos of the stained glass window depicting St Scholastica and the chancel ceiling painted with gold stars on a blue background — although medieval-looking, this was actually done in 1914. 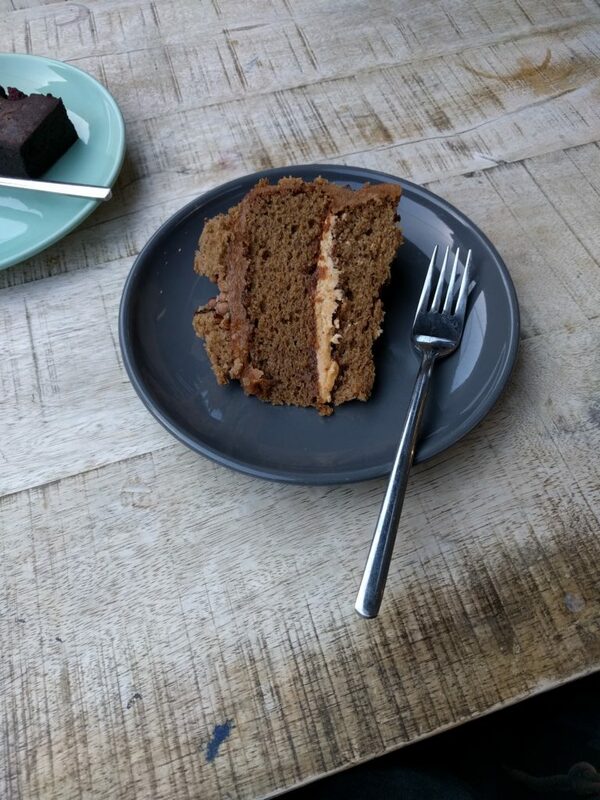 When our walk was over, husband and I treated ourselves to coffee and cake before returning home — well, all good excursions finish with cake, in my opinion. I hope I’ve given you a flavour of the walk. I would certainly encourage anyone who is interested in the history of Oxford and its industrial past to do one of Liz’s tours. My take-home message is that it is always worth exploring further the places we think we know, and even better if that exploration is done on foot, and with someone who knows the history. My thanks to Liz for opening my eyes to the history and buildings of St Thomas’s parish. Do you have any favourite places that are off the beaten track?